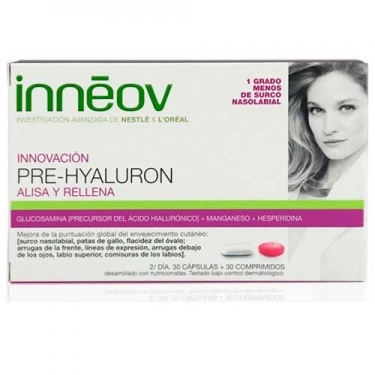 Innéov- Pre-Hyaluron is an Innéov nutritional anti-aging supplement for smoothing and filling, working from the inside. This formula is an expert anti-wrinkle being the only precursor of hyaluronic acid and targeting 8 signs of skin aging: nasolabial lines, chicken feet, sagging skin, wrinkles and expression lines, wrinkles under the eyes, wrinkles on the upper lip and in the corners of the lips. This formula was developed with a unique complex of ingredients: Glucosamine, hyaluronic acid, manganese and citrus hesperidin to promote firmer results, and a soft and padded appearance. Take one capsule and one tablet per day during a meal. For best results take during 4 weeks at least.